A volcano on Indonesia’s tourist island of Bali shot a new burst of hot ash into the air early Sunday in the latest of the country’s several eruptions within a week. Mount Agung erupted for about three minutes, spewing white clouds of smoke and ash more than 700 meters (2,300 feet) into the air, the Volcanology and Geological Mitigation Agency said in a statement. The eruption of the 3,031-meter (9,940-foot) volcano didn’t prompt evacuations, and its alert status remains at the second-highest level. The agency warned tourists to stay away from the danger zone in a 4-kilometer (2.5-mile) radius around the crater. Agency spokesman Sutopo Purwo Nugroho said that white dust from the eruption blanketed several villages close to the mountain slope in Karangasem district. Ngurah Rai International Airport spokesman Arie Ahsanurrohim said that flights were operating normally. Authorities said the air around Denpasar, the Bali provincial capital, is clear from ash. More than 140,000 people had fled the area around the mountain in late September after its alert status was raised to the highest level, indicating an eruption may be imminent. The alert status was lowered two weeks later, allowing for the return of those displaced from government shelters. An eruption in 1963 killed about 1,100 people. Agung lies about 70 kilometers (45 miles) northeast of Bali’s tourist hotspot of Kuta. 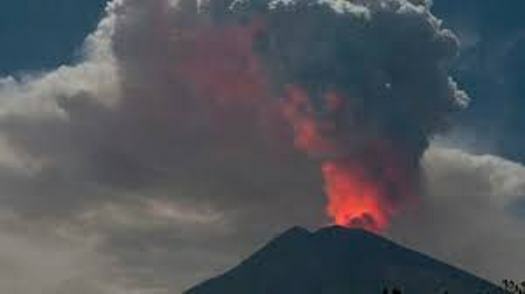 It is among more than 120 active volcanoes in Indonesia, which is prone to volcanic eruptions and earthquakes because of its location on the so-called “Ring of Fire” — a series of fault lines stretching from the Western Hemisphere through Japan and Southeast Asia. Last week, Anak Krakatau in Indonesia’s Sunda Straits erupted and collapsed into the sea, causing a tsunami that killed 431 people on Java and Sumatra. More than 46,600 were displaced.